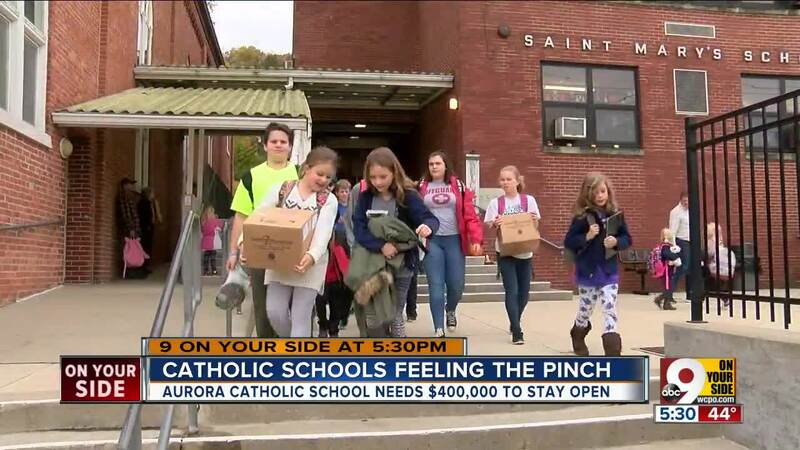 An Aurora, Indiana, Catholic school needs $400,000 to stay open. AURORA, Ind. -- A small Catholic school is wrestling with a big problem: where to find money to keep its building open the rest of this school year. St. Mary's School in Aurora has been part of the community fabric since 1866. But they need to raise $400,000 by Dec. 31 to keep their doors open. Jim Waldon graduated from the school in 1970 and began teaching reaching and English there in 1979. Waldon also directs the school's bell choir and has been the music director at St. Mary's Church since 2001. "It's a great place to live," he said. "It's a great place to work because of the spirit of cooperation." Waldon's concern about the financial challenge ahead starts with the school's 20 yeachers and staff members. "We're also concerned for our students because these students and their families have become our families," he said. Bob Brookbank became the school's principal in August. He said he wasn't aware finances were so tight. "The reason we're in this position, it's the lack of pupils, and the side of the church and masses and offerings are not sufficient at this time," he said. St. Mary's had 140 students 10 years ago. Now they have just 80 in grades K-8. A "keep the doors open" campaign is underway, seeking funds from alumni, church members and the community. "We've started this campaign because we know we have fantastic parishioners — we have talent in this community — and I really believe we will reach our goal," Brookbank said. Suzy Rice shared the sentiment. She has taught math and science for 23 years. "I hope that miracles will happen and I hope things will pull through," she said. Rice said she wouldn't want to be in a classroom anywhere else. "I think a lot of it has to do with parental support, the small school atmosphere, the one-on-one attention, help, a good staff," she said. "We get along really well." Backup plans could have students attending Catholic schools in Sunman, Batesville or Lawrenceburg. But people in Aurora were still optimistic it won't come to that and they will reach their goal.